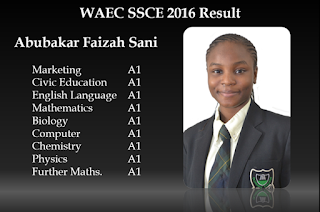 WHEN Miss Faizal Abu bakar Sani, 17, a former student of Olumawu School, Abuja, was writing her West Africa Senior School Certificate Examination, WASS-CE, few months ago, little did she know that the examination would earn her a scholarship to study any course of her choice in any university in the world of her choosing. As fortune smiles on her, Faizal’s scholarship as stated by the Kano State Government, where she hails from, will know no bounds, as it covers university education in any foreign country to whatever level she wants. Faizal, who was celebrated by her alma-mater, Olumawu School, Abuja; had nine A1 in the May/June 2016 West African Senior Secondary School Certificate Examination (WASSCE). She had A1 in English Language, Mathematics, Further Mathematics, Chemistry, Physics, Biology, Computer Studies, Civic Education and Marketing. The result was adjudged by her school and Kano State government as the best ever in the state. She, however disclosed that when preparing for examination, she reads and takes a break every 30 minutes. On her part, Faizal’s mother, Mrs. Hadiza Abubakar, who is a lawyer, described her daughter as a quiet, reserved and responsible girl who has shown intelligence right from her birth. She said: ‘’I have not in anyway influenced her because she has a mind of her own. Mine is just to guide her and advise her. She is a young girl with an already set mind. I wanted her to go into software engineering, but she said she wanted to read Biomedical Engineering. The governor of Kano State, Abdullahi Ganduje on his part said: ‘’The scholarship is meant to cover her undergraduate, postgraduate and doctorate degrees at any university of her choice across the world. This gesture is to acknowledge merit and to especially encourage girl-child education in our state. In her reaction, former Chief Justice of Nigeria, Justice Aloma Muktar said that Faizal’s academic feat boldly represents the new era for the girl child in Nigeria. She said: “Once upon a time, girl child was a second class member of her family and society but today, things have changed for better as both sexes have equal opportunities to activate their natural potentials and strive for the best in their life time”. The Minister of Education, Alhaji Adamu Adamu, charged Faizal to sustain the tempo of her excellent academic feat by taking it to the realm of invention and end up being an inventor who will do Nigeria proud in future. Also, Barrister Arome Audu, a member of the School’s Governing Council who described Faizal’s academic feat as one akin to the one attained by the founder of the school, the late Chief (Mrs.) Margaret Oloruntomiwo Audu as a student at that level in 1951, saying “Faizal is another Mrs. Audu in the making”. “Faizal by this excellent result has made every minute of her existence and in particular, of her schooling here in Olumawu within the last six years counts. Therefore to all other students of the school coming after her, let every minute of your schooling count as well,” he said. He commended the parents of Faizal for following her up academically on the home front while schooling and preparing for the examination and urged other parents to do likewise to their children just as he saluted the teachers of the school for imparting the right knowledge into her and others, culminating in their excellent performance in both WAEC and NECO examinations. Meanwhile, in a reaction to this academic feat, WAEC has said through its spokesman, Mr. Demianus Ojijeogu, that WAEC has not officially announced the best WAEC candidate in the May/June 2016 examination.